In the year AD 1220 when the construction of the Cathedral of Amiens began, the invention of the printing press was still more than two centuries away. Books were handmade and not available usually to the general public; a majority of people were unable to read. For them, subjects in the Bible were learned through the spoken word and the visual arts. Illustrations in mosaics, stained glass, paintings, and sculptures, re-enforced visually the biblical stories they heard. These arts were an integral part of their churches. The three recessed arched entrances of the Cathedral of Amiens are covered completely with relief sculpture. 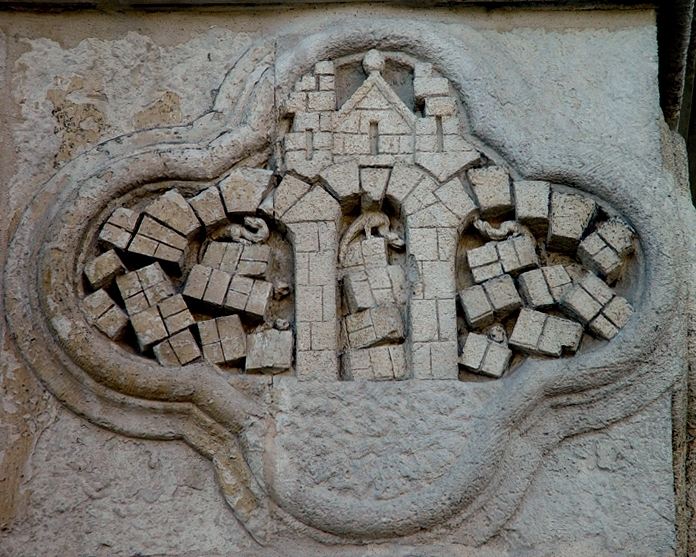 The walls are flanked by biblical figures carved in high relief and the space above the central doors – the tympanum – depicts the Last Judgment. From eye level to ground level, a base with two rows of relief sculpture framed in quatrefoils continues around the interior of all the buttresses of the façade. The figures in the base of the central portal depict virtues with their corresponding vices. From there, the rows continue with scenes of the Major and Minor Prophets. The images depicted in the top row show significant events in a prophet’s life; other important events associated with him are placed directly below it. The prophet Haggai (HAG-eye) is represented by four scenes but he is not pictured on the upper row and he appears in only one of the quatrefoils. The Temple in ruins shown above is in the upper row and God is standing in the quatrefoil directly beneath it; Haggai is seated to his left. God is pointing to the Temple above him and calling Haggai’s attention to the fact that it has been left in ruins by the people. The scenes representing most of the prophets are self-contained; the subjects are complete in themselves. The ruined Temple differs, however, in that it is linked to the scene of God and Haggai below it. The two images support each other to complete a visual message. In ancient times, people and animals in distant lands tended to be a mystery; often the descriptions of them were a result of the imagination. A host of animals and creatures – sometimes with frightening powers – were imagined and became part of the lore that was passed down through the ages. Bestiaries compiled during the Middle Ages included special attributes and symbolic associations with creatures such as unicorns, basilisks, and griffins. These and other imagined animals often appeared in medieval art. At Amiens, the ruined Temple of God is being inhabited by reptile-like creatures crawling among the fallen stones and rubble. Previous Previous post: Is Israel’s Big New Find for Real?